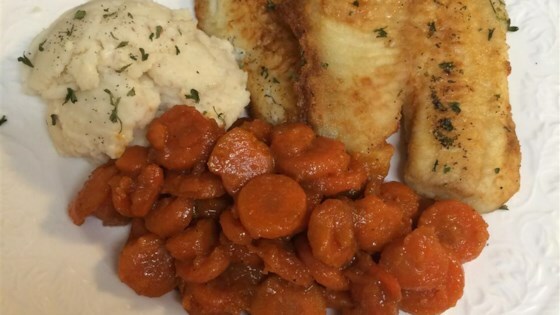 "Simple dish with tender carrots with a buttery glaze and a mild sweetness." Made for me and my husband. They were okay. Kind of bland. These were excellent! I made two small changes - had some baby carrots that needed used, so I used those, and I added about 1/4 t. cinnamon. Even my 3.5 year old asked for seconds! The flavor is fantastic! Know that if you're using baby carrots (as pictured) vs carrot sticks as noted in the recipe, simmering for 10 minutes will leave them still quite crunchy in the middle.